Swinton Estate has recently applied for planning permission to build homes in Masham. This is an exciting opportunity for the town which, handled sensitively and without compromising on quality, will ensure the long term development of Masham on a sustainable and responsible basis. Swinton Estate is owned by a local family who have supported the town of Masham for over 100 years. They are actively involved in the community, have invested heavily in numerous commercial enterprises and take the interests of the town to heart. Do you wish you could live in Masham? Do you have family or friends who are currently unable to live in Masham due to housing shortages or a lack of affordable homes? Are you an employer who wishes you could employ more local people, or finds that you can’t fill vacancies due to lack of accommodation? Are you a retailer or the owner of a business in Masham who wishes there were more local shoppers? Do you wish the younger generation did not have to struggle to find somewhere to live in Masham? Harrogate Borough Council have identified two sites in Masham that are suitable for housing in their draft Local Plan, these sites are owned by Swinton Estate. The calculation given for the number of homes that will be required is based on demand over a 20 year period, and that there will ultimately be a requirement of 129 homes on these two sites. Site plan and housing allocation as shown in the Local Plan (PDF). On the basis that more homes are already required in Masham, Swinton Estate have applied for planning permission to build homes on the site adjacent to Thorpe Road. The development will be phased in the sense that each zone of housing will be built in line with the current demand for both market value and affordable homes. Swinton Estate’s expectation, based on current forecasts for housing demand, is that the final phase would not be completed for at least 10 years. What has Swinton Estate applied for planning permission? Whilst Masham is currently a vibrant market town, it is at the same time the case that the business and resident community would benefit from additional housing. The shops, cafes and pubs would gain trade from additional households, and employers would benefit from a larger pool of local workers. Swinton Estate has been in consultation Harrogate Borough Council about the housing requirements for Masham since 2012. The draft Local Plan that will set this out will not be finalised until 2018 at the earliest. Having established the location of the preferred sites, Swinton Estate took the view that an application should be submitted sooner rather mindful of the average application process period and the need that already exists for housing. Why should there be more houses on the Thorpe Road site? Harrogate Borough Council have already suggested this area as being the most suitable. Having investigated other potential sites, it has become apparent that many sites close to Masham are within a flood risk zone, which would not be suitable for housing and might in any event be better retained as open spaces. 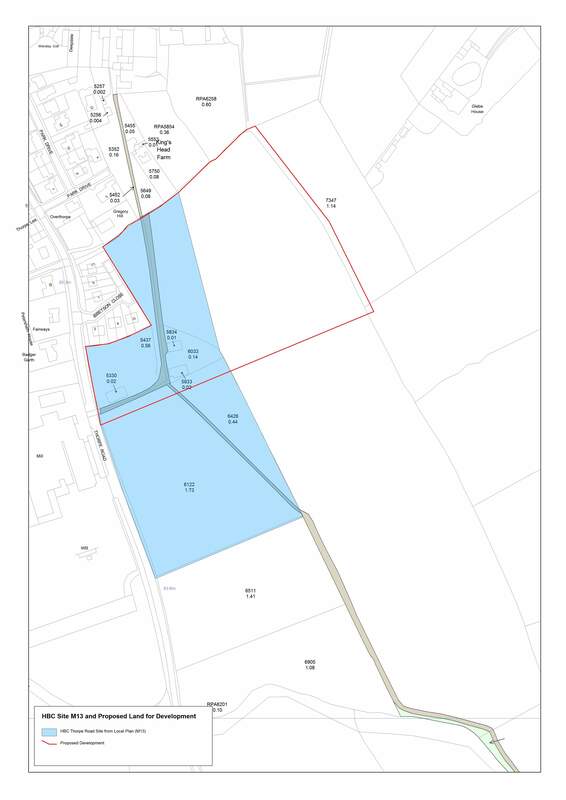 This plan (PDF) shows the flood risk with the areas prone to flooding in blue and Thorpe Road application site outlined in red. The application plan does not completely match the Harrogate Borough Council allocation site plan. As you will see from this plan showing the application site it sits across the northern end of the HBC site and extends to the west. During the consultation exercise with key stakeholders, it was suggested that siting houses close to I’Anson’s mill might make operations for the mill difficult. It was in response to this that Swinton Estate decided to change the position of the application site in order to take these concerns into account. At the same time, the impact of the development on the footpath would be reduced. Who can live there and what will the houses be like? The development will be a mix of market value and affordable housing. As a guideline, the current mix required by Harrogate Borough Council is 60% market value and 40% affordable housing. In order to qualify for affordable housing, an applicant would need to meet various criteria. These are set out in the Affordable Housing Eligibility Criteria (PDF), which clarifies what is required in terms of there needing to be a strong local connection to the Masham community. As this is an outline planning application (which deals with the site and number of dwellings) there are no design details available at the moment. At a later stage, Swinton Estate would consult with the local residents in terms of design options and what would be preferred. How will the Thorpe Road development impact on the Masham community? More houses and more people in Masham will be of a positive benefit in the sense that they will help support the shops and businesses, but on a wider level the community groups should expect to see an increase in support and attendance. For example, those that could benefit from this would be the Church and Chapel, the Library and Community Office, and community organisations such as the Sports Association, Horticultural Society, Tennis Club, Guides and Scouts, Golf Club, Masham Players etc. In addition, with more residents in the town, more passengers will use and support the existing bus service. Once more demand has been demonstrated the easier it will be to lobby for further improvements in the service. As part of the planning application process, Swinton Estate engaged in a community and stakeholder consultation exercise, and the Statement of Community Involvement (PDF) sets out what was discussed and the views that were raised.. Increased traffic : the transport assessment submitted with the planning application established that the increase in traffic generated by the development would be limited and could be accommodated on local roads. It should be noted that the two largest employers in Masham are situated on this side of the town and that residents on the development would not be driving to work through the town at all. Drainage & Sewerage : Yorkshire Water have confirmed that the sewage works have capacity for 100 additional houses. Their letter here (PDF) advises that surface water cannot be discharged into it, which the development can be designed to accommodate. Masham Surgery : a discussion was held regarding whether or not the surgery could cope with additional patients. The surgery advised that although it is nearing capacity, should there be additional demand then steps would be taken to accommodate this. Local Schools : The NYCC assesment (PDF) identifies that there would be 25 children needing to attend a local school if there were 100 new dwellings. This would be the position once ALL houses had been built (which would not be for at least 10 years) and assumes that all children would be of primary school age. The 25 additional children would be spread across all seven years of primary school education, so this gives an average of 3.5 children per year group. A meeting was held with the NYCC Education Team, Masham School Governors and the Diocese Director of Education. It was established that there are currently capacity issues at Masham School but there was potential for expansion. Swinton Estate will be required to make a financial contribution to the school as a planning condition, and the contribution assessment guidance sets this at £339,900 – which Masham School can apply to their expansion plans. It was also noted that there IS capacity both at Kell Bank and Grewelthorpe schools. 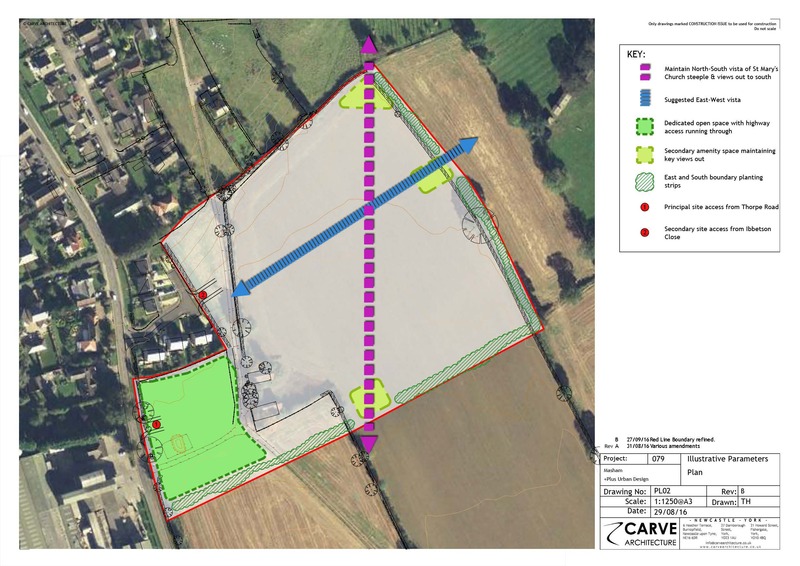 The development access, views and sightlines plan indicates the provision that has been made to ensure that the impact of the development on the surrounding countryside, nearby housing, views of the church and footpath running through the site will be kept to a minimum. There will also be provision for open spaces and a playground within the development. As is the case with any planning application for housing, it is a requirement that a desktop survey for contamination on the land takes place. This is standard practice. Should further investigations then establish the presence of anything hazardous, Swinton Estate will be required to remove it from the site before any building could take place. If you would like to make contact with Swinton Estate to find out more about the development or to submit your views to Harrogate Borough Council, please see ‘Who to Contact’ below for more details. Wanting to find out more details about the application? Please do not hesitate to contact Swinton Estate’s Head Office on 01765 689224. For all press enquiries please contact Jenny Bourne-Arton on jenniferemilythompson@yahoo.co.uk. Are you currently looking for affordable housing in Masham? If you require further information, the Council’s specialists are available to provide you with advice regarding how to register for housing. They can be contacted by phoning 01423 500600 and by following the options presented. Would you like to SUPPORT the Swinton Estate application? If you are in support of the Thorpe Road planning application, please contact Harrogate Borough Council to indicate that you SUPPORT the application – it is important that you make this a clear statement for it to count! The need for new housing in Masham as there has been very limited development over the last 15-20 years. Perhaps you or your family are working in Masham or have strong connections to the town but are living outside of Masham because there is not any housing available? How do it submit a SUPPORTING representation? If you would like to contact HBC, please remember to quote the application number in any correspondence sent which is 16/04659/OUTMAJ. Full details of the planning application can be seen on Harrogate Borough Council’s Public Access website, which can be found using the following link: https://uniformonline.harrogate.gov.uk/online-applications/ . The application number is 16/04659/OUTMAJ, please enter this in the search bar provided if required. Please see the Statement of Community Involvment (PDF) which sets out the full extent of the public consultation process.